Verizon updating BlackBerry Bold 9650 and BlackBerry Curve 3G 9330 this month? Sure seems that way when looking at a piece of documentation found over at Android Central. We're not sure if it will be a rollout of BlackBerry 6 or not at this point but the BlackBerry Bold 9650 will be moved into a MR3 release while the BlackBerry Curve 3G will be hitting MR1. 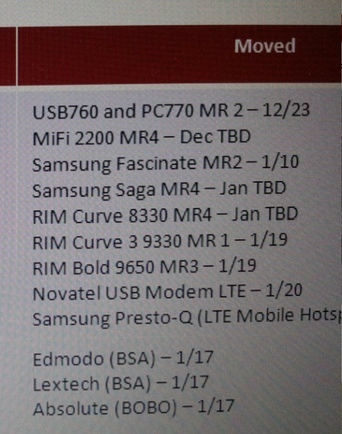 Also noted is a MR4 for the BlackBerry Curve 8330 but that is left at TBD. Of course, we know that won't be getting BlackBerry 6 but the others really should be at this point. Guess we'll just have to wait it out and see but if all goes as we hope it does, BlackBerry 6 will hit land on Verizon soon. Keep in mind; its been delayed before so it could happen again.